And nobody knows more about that than Dicken Elementary garden coordinator Carolyn Herrmann, who in two years has helped turn a small, under-utilized vegetable garden two years ago into an edible organic garden complete with an outdoor classroom, raised beds tended by all classes, and wood chipped paths that allow children to tromp through the woods in the fresh air, learning about butterflies and foliage. Carolyn Herrmann pauses for a photograph in the garden she helped transform with the help of these and many other volunteers. Photo by Jo Mathis. 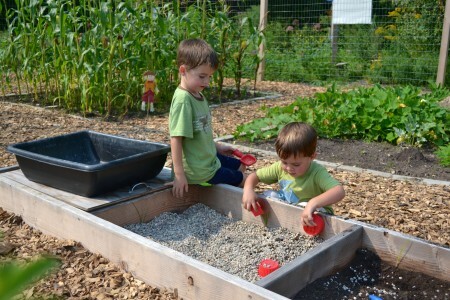 The garden is integrated into the classroom curriculum in all grades and subjects, starting with the youngest children learning about colors in the rainbow garden. 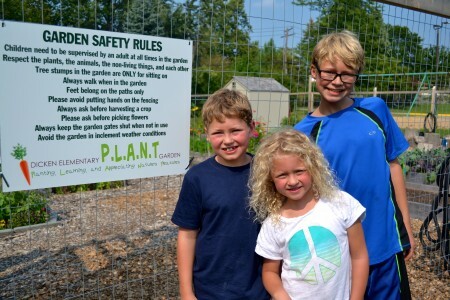 Dicken first grader Cooper and his little brother, Noah, 3, enjoy exploring the Dicken PLANT organic garden. Photo by Jo Mathis. 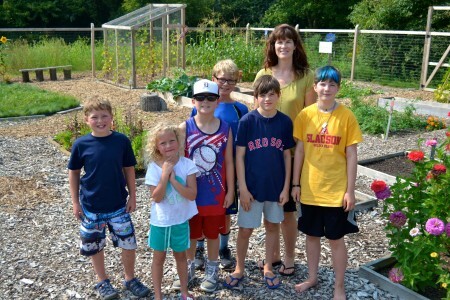 Herrmann said the main goals are to educate students on living healthy and growing organic food; teaching them to respect and care for the earth and each other; provide students with a hands-on way to learn lessons that complement curriculum and beyond; and be a model for families that may want to explore growing their own produce. Noah, Rebecca and Elijah helped name the garden. Photo by Jo Mathis. Installed a dirt, sand and water bed for the kids to explore/play in. This is a curriculum tie-in for kindergarten classes, who have a science unit with the same name. Installed quote signs inside the garden and rules signs outside the garden by the front and side gates. Installed a cultural crops bed—crops with origins around the world that have labels describing their history. Installed the Little Free Library and a no mow grassy reading area of several native grasses that don’t need mowing because they only grow about six inches. Herrmann spent weeks leading up to the big spring work day prepping the site; securing supplies; meeting delivery people at the site while working on edging out the reading garden and Little Free Library sunflower area. She said a lot of credit goes to Michelle Loewe, who started and ran the program before she recruited Herrmann to take over. Working together this past school year, the two were able to oversee the transformation. Hermann also expressed thanks for all the Dicken parents who helped, especially Peter Arendall, whose assistance was integral to many of the infrastructure additions, including the pole bean house, fencing, gates, trellis and chalkboard. Jonah Klein, a Dicken fourth grader, said that he’s helped weed, plant seeds, dig holes, and dumped wood chips on the trails. “It’s fun to be around all the plants and be outside,” said Jonah, whose favorite part of it all has been learning about the various plants. Jonah is proud of the fact that his family actually came up with the name of the garden. “Its name is P.L.A.N.T., which stands for planting, learning, and appreciating nature’s treasures,” he said. His older brother, Elijah, just started sixth grade at Slauson, and says he’ll miss the Dicken garden. “Everyone’s so committed to it, and it’s so beautiful,” he said. 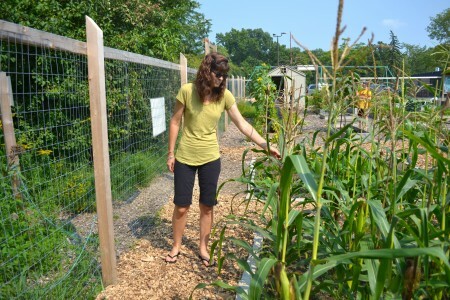 Nikki Klein said her family likes to garden, but doesn’t have much space for one at their house. “We were involved in a community garden through our synagogue for several years, and when the Dicken garden started up, we jumped right on because it’s so much more convenient,” she said. “We can see it every day, and the kids can really appreciate it. And having four kids going through Dicken, we’re very invested in the community and the school. She said the garden about four years ago started with she and another parent digging a patch of soil and placing some seeds in it. This past spring, because of the grants, there were rapid and dramatic changes. “I’m very thankful for Carolyn,” said Klein. “She’s made it what it is. Principal Mike Madison said the school was blessed to have Herrmann and Loewe in the Dicken community the past few years. “The transformation from just a few plots of wild flowers to a comprehensive interactive educational garden … leaves me speechless,” he said. This is Herrmann’s last year as garden coordinator because her daughter just started at Slauson and her son is in his final year at Dicken. So one of her jobs this year will be to find a few parents to step in and take over. The hardest part about running a school garden is getting enough bodies in the garden to help with upkeep and help run programs, she said. But she wants everyone to know what an enriching and valuable experience it is for Dicken students. Students Sebastian and Audry, in the Lawton garden. Photo by J. Adrian Wylie. 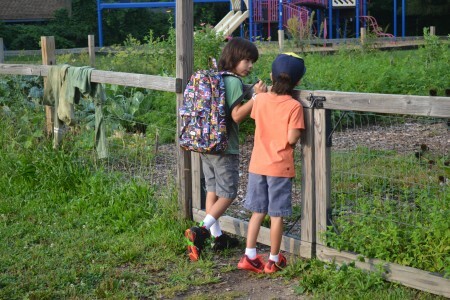 These brothers check out how much the Burns Park garden grew over the summer. Photo by Jo Mathis. 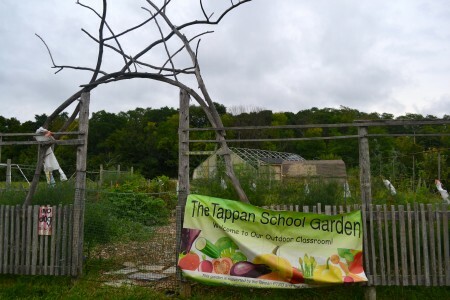 The Tappan School Garden will also be featured on the Sept. 20 garden tour. Photo by Jo Mathis.